Chen Yongle's harmonious colours and elegant lines, rendered in a style that has come to be known as the Yunnan School, express the beauty and mythology of Yunnan's rich culture and ethnic minorities. Chen Yongle works in ink on Korean rice paper as well as reduction woodblock printing. Chen Yongle (b. 1944, Chongqing) is one of the most significant living artists in China's Yunnan Province. He has been widely exhibited internationally and collected by fine art museums in China, Japan, Taiwan, Hong Kong, France, Belgium, Holland, Germany, and the United States. His works command a high price and a loyal following, especially in Asia and the United States. He is the president of the Yunnan Research Institute, and is a member of the Chinese Artists Association, Chinese Graphic Artists Association, and the Association of Artists of Chinese Craft and Art. 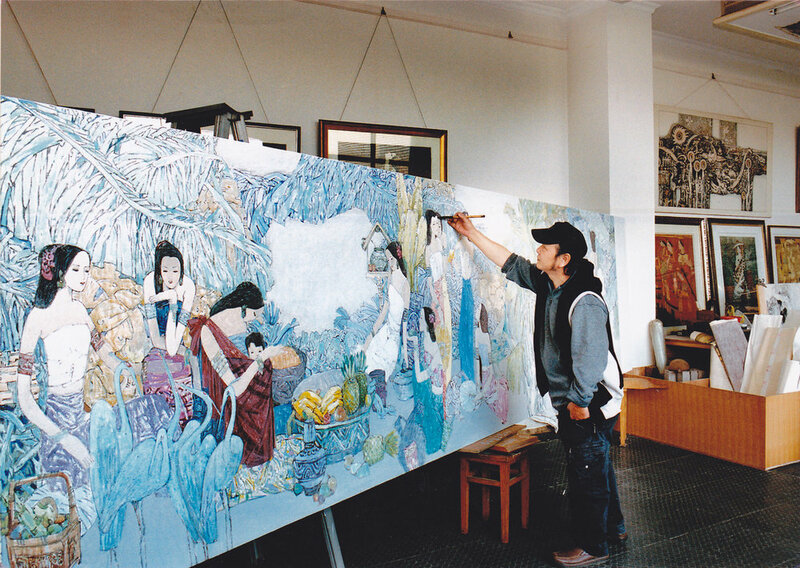 Chen Yongle is the father of the equally talented Chen Li (b. 1971) whose works are also featured here. Although father and son differ widely in style and subject matter, Chen Yongle's influence can be seen in Chen Li's highly original use of dynamic lines and harmonious colours.